The company in Newton's Cradle. Photo by Michael Kushner. BOTTOM LINE: Newton’s Cradle continues to develop into an exciting new musical about living with autism. Newton’s Cradle allows audiences a peek into Evan Newton’s mind and family as he navigates life and relationships on the autism spectrum. When Evan brings his girlfriend, Charlie, to the family’s Alaskan cabin to propose to her, he is thrown by her response, and is sent through a whirlwind of memories to work through what’s keeping her from saying “yes.” Most of the moments he recalls show how the family responded to Evan’s diagnosis, and how they’ve all adjusted their lives to work around his needs. Heath Saunders is quickly rising in acclaim as one of the hottest young composers in NY, and for a good reason. (If you haven’t heard Heath’s music yet, do yourself a favor: Go to heathcliffsaunders.com, check out some of the tunes there, especially “See You Tomorrow," and get ready for your next musical obsession.) His Newton’s Cradle score is a fascinating hybrid of Next To Normal’s familial angst against an electro-synthesized soundscape, and Light in the Piazza’s rippling arpeggios that dance around the family’s worries for Evan and his mental disability. The book by Kim Saunders (Heath’s mother) packs a lot of family history into its non-linear structure, reflecting how Evan’s own memory jumps around, and doesn’t distinguish the passage of time between yesterday and yesteryear. It’s a clever structural device, but the book loses sight of both this frame inside Evan’s mind and the central dramatic question when so much time is spent on events outside Evan’s perspective. That said, the musical is still early in its development, and these are storytelling questions that would be easy to resolve down the line. Standout performances include Rachel Kara Perez, as Evan’s fiercely intelligent and strong-willed girlfriend Charlie, and real-life brothers Heath and Trent Saunders as Evan and Michael Newton. It’s also worth noting how refreshing it is to see a multi-racial family depicted onstage without race being an “issue” in the story. Instead, Newton’s Cradle embraces American intersectional diversity at face value, and moves on to the deeper, more relevant questions in the family’s life. Newton’s Cradle takes place in and around the Newton’s Alaskan cabin, southeast of the soaring Denali Mountain. Though the set by Luke Hegel Cantarella and the costumes by Maria Hooper are kept fairly simple for this festival setting, both design elements offer the flexibility for scenes to move forward and back in time. With director Victoria Clark, Cantarella finds creative ways to repurpose the cabin furniture for locales outside the cabin (for example, the kitchen table and Evan’s swing, both safe spots for Evan when he’s having a bad day, are indicated by the same piece of furniture). Clark also cleverly directs the characters, instead of stagehands, to reset each scene, allowing this action to drive transitions between scenes. Lighting designer Zach Blane clearly benefited from the cyclorama in the NYMF’s rep plot, used here to paint beautiful color projections of the Alaskan summer skyline. Perhaps sound designer Quentin Chiappetta and music director Jesse Kissel play the most significant role in giving us a window into Evan’s world and mind. Their soundscape clearly defined when Evan was over-stimulated or calm, or when his mind was buzzing with electronic vibrations to solve a puzzle. In addition, the recurring creaking door sound effect emphasizes both Evan’s sensitivity to the loud noise, and his fixation on the people he loves walking in and out of his life. The NYMF offered a wonderful showcase of Newton’s Cradle this summer, and I look forward to watching the musical’s future development. Newton’s Cradle has a book and additional lyrics written by Kim Saunders, and music and lyrics by Heath Saunders. It is directed by Victoria Clark. Choreography and associate direction is by Sara Brians. Music direction is by Jesse Kissel. Scenic design is by Luke Hegel Cantarella. Lighting design is by Zach Blane. Sound design is by Quentin Chiappetta. Costume design is by Maria Hooper. Orchestrations are by James Dobinson. Dramaturgy is by Emily Maltby. Production Stage Manager is Melanie T. Morgan. Executive Producer is Robb Nanus. 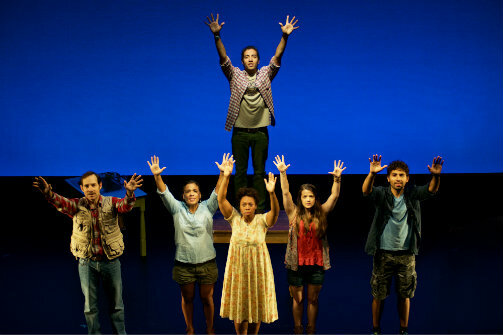 The cast is David DeWitt, Rose Hemingway, Rachel Kara Perez, Heath Saunders, Trent Saunders, and Andrea Jones-Sojola.